Ready to use (no dilution required) chemicals, designed for use in all brands and types of automatic roller type processors. 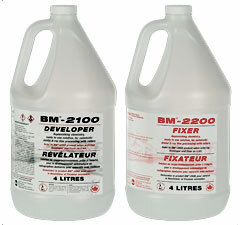 BM®-2000 is the market leader in convenience, efficiency and sensitometric properties. 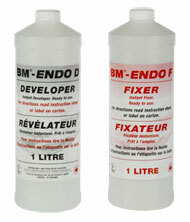 Packaged 2 x 4 L of Developer (BM®-2100) and 2 x 4 L of Fixer (BM®-2200) per case. Specifically formulated to give superior results in rollerless type processors. Ready to use (no dilution required). 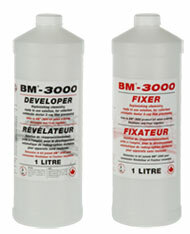 BM®-3000 PRO is conveniently packaged 3 x 1 liters of Developer and 3 x 1 liters of Fixer per case. This ready to use cleaner can be sprayed on to rollers during preventive maintenance sessions. 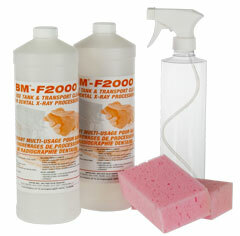 Product can also be used to fill tank and soak transport during thourough cleaning sessions. Kit contains: 2 x 1 litre bottles, sponges, empty easy to use sprayer bottle, instructions. Warning: May slightly etch stainless steel. Use in utility sinks. Read instructions prior to use.